PULLMAN, Wash (June 1, 2016) — Pictures taken In a secret underground darkroom under a barrack apartment in a Japanese American relocation camp during World War II inspired the production of “The Legacy of Heart Mountain”, a documentary to be shown at the 2016 Chicago Japan Festival at the Forest View Educational Center Theatre, June 11 at 4:45 p.m. and on June 12 at 4 p.m. in Arlington Heights, Ill. The photos taken in Heart Mountain, Wyo., are among more than 2,000 taken by George Hirahara and his high school aged son Frank between 1943 and 1945. 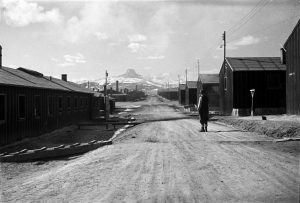 Comprising the largest private collection of photos taken at Heat Mountain, they tell personal family stories of life behind barbed wire, as well as documenting some of the many events held at the camp. One of those stories is of the founder of the Buddhist Temple of Chicago, Rev. Gyomay Kubose, who after being released from Heart Mountain started his own temple in Chicago in 1944. The Hirahara’s took pictures of Rev. Kubose and one of the Buddhist altars in Heart Mountain which was later brought to the Chicago temple. Rev. Kubose spoke fluent English and was from Los Angeles prior to his family’s incarceration. “Many from Heart Mountain moved to Chicago after World War Two so these photos bring a unique history to a community over 70 years later,” said Patti Hirahara, Frank’s daughter. In 2010, Patti Hirahara donated the photo collection to her father’s alma mater of Washington State University. Patti, of Anaheim, Calif., will attend the Festival to introduce the documentary. In 1984 she was the only American member of JETRO’s First All Japanese Women’s Buying Mission to the United States from Japan, looking to find suitable American products to sell in the Japanese Market. The 33 member delegation began their 15 day mission in Chicago at the National Housewares Show. “I’m happy to return to the Windy City to introduce this documentary which has also been shown at the Smithsonian’s National Museum of American History,” she said. This will be the first time the documentary is shown in the Chicago area. 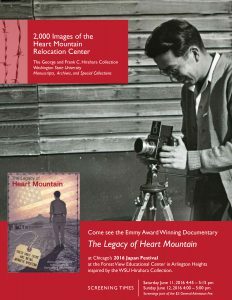 For more information on the photo collection and film documentary, visit www.heartmountainfilm.com.